The Arsenal legend saw his depleted Monaco squad sustain more injury problems in a crushing 4-0 home Ligue 1 loss. PSG striker Edinson Cavani celebrates a hat-trick against Monaco. EDINSON CAVANI HIT a hat-trick on his return to the Paris Saint-Germain team as the Ligue 1 champions marched on with a 4-0 demolition of Thierry Henry’s injury-hit Monaco. 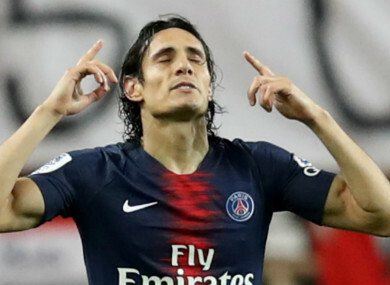 Cavani missed PSG’s last two Ligue 1 wins due to a thigh injury and he was on the bench for a midweek Champions League draw against his old club Napoli. But the striker was back in the PSG side at Stade Louis II on Sunday, scoring a trio of close-range finishes as Thomas Tuchel’s men extended their perfect league record to 13 wins. Neymar added a fourth from the penalty spot and PSG’s lead atop the table already stands at 13 points while Monaco are in the mire, with Henry’s side only off the bottom on goal difference. Neymar’s cross-shot was turned in at the back post by Cavani for the opener and the Uruguay striker was soon enjoying more delayed celebrations thanks to the video replay system. Cavani grabbed his hat-trick in the 53rd minute, tapping in a Diaby cross to take his tally to eight Ligue 1 goals this season after Adrien Rabiot’s throughball had split the Monaco defence. Mbappe saw a late fifth ruled out for offside after yet another VAR review but the scoreline already reflected PSG’s total dominance in a complete mismatch. Email “PSG star Cavani's hat-trick adds to Thierry Henry's woes”. Feedback on “PSG star Cavani's hat-trick adds to Thierry Henry's woes”.